Buffalo Waterfront & Lake Erie. Buffalo Niagara International Airport (BUF) is around 16 km/10 mi northeast of downtown Buffalo. The airport is served by domestic airlines (Boston, New York JFK/LGA, Washington DC, Chicago O'Hare ORD/Midway MDW, Charlotte and even Las Vegas and Phoenix) and some holiday charters to Cancún. The rather irregularly scheduled NFTA buses #24 and #204 will bring you to downtown Buffalo, check schedule ahead. Fare is $2.50 one-way (exact change recommended, bus drivers can't make change). Niagara Falls International Airport is near Niagara Falls, NY but doesn't operate passenger flights anymore. The next big international airport would be Toronto Pearson in Toronto, ON (Canada). It's around 2 hours car drive to Buffalo (time for immigration at the US/Canadian border excluded). It offers flights to USA, Europe, Asia and South America. There are rather cheap and very comfortable direct express bus lines like Megabus or Greyhound linking downtown Toronto with Buffalo Niagara airport/downtown Buffalo. Mind the global entry regulations for non-US citizens! We're starting from the Niagara Frontier Transportation Authority (NFTA) a.k.a. main bus terminal in downtown Buffalo (assuming you've just arrived in Buffalo and you're very eager to explore around). So let's head to the south in Ellicott St. This baseball field is the home of the Buffalo Bisons. It can accommodate over 17.000 spectators. The Ellicott Square Building (just diagonally to the north-west from Coca-Cola Field) used to be the biggest office building till 1908. We go further past Five Flags Park and reach St. Paul's Cathedral. Coca Cola Field. Home of the Buffalo Bisons baseball team. St. Paul's Cathedral was built in 1873. Nowadays this Episcopal church is listed on the National Register of Historic Places. St. Joseph's Cathedral is just around the corner, a block away. The Roman Catholic church was completed in 1862. This building from 1871 used to house the city hall till the 1930s. 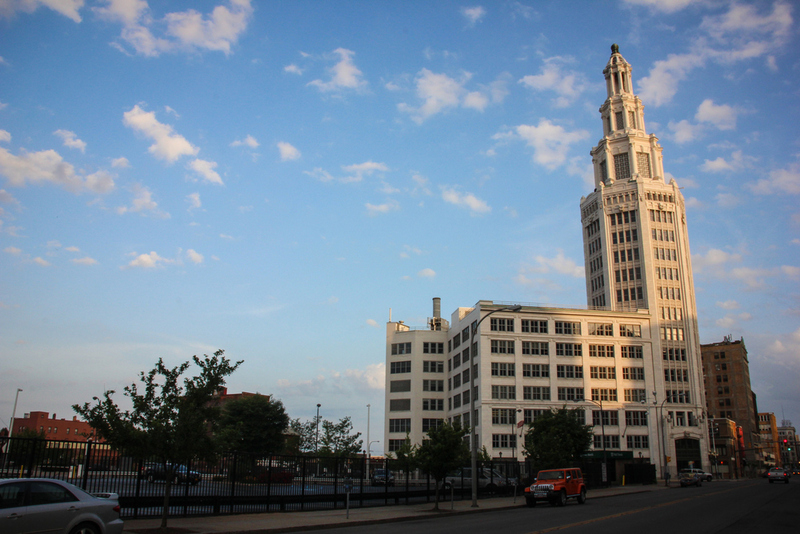 Now it accommodates some offices and archives of Buffalo. Niagara Square with its McKinley Memorial in the center is quite frequented by local buses. You will notice that many places in Western New York bear the name "Niagara": Squares, streets, banks, companies, even Buffalo's multi-functional event hall is called First Niagara Center. 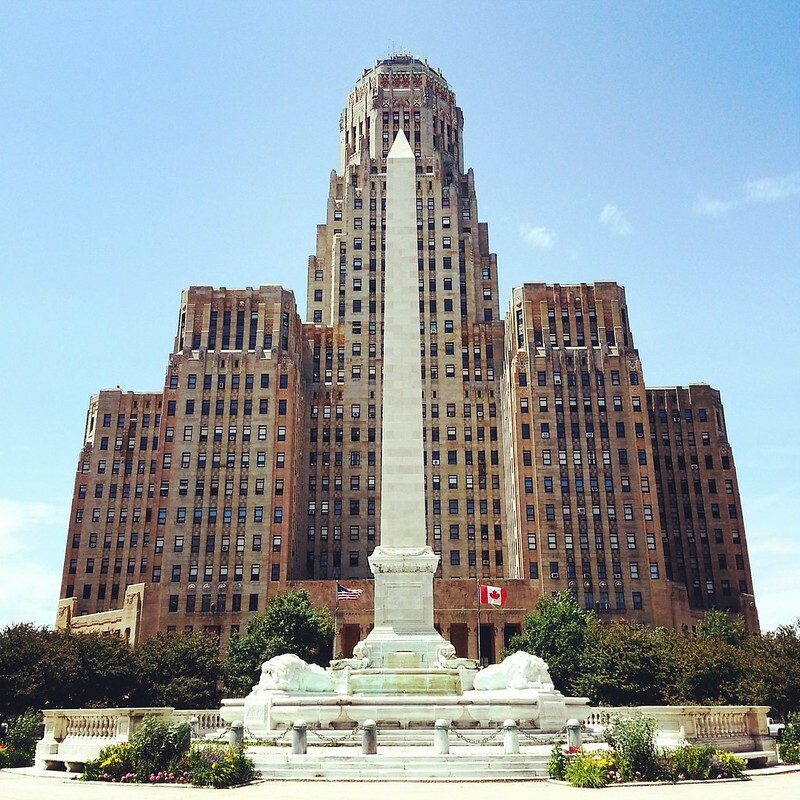 To the west side of the square you'll find Buffalo City Hall. The Art Deco building from 1932 has a viewing platform on the last floor: free admission! Just ask at the information desk about the directions (the City Hall closes around 5 pm). The view from the deck is awesome: To the west Lake Erie and Canada can be seen. The "HH" shaped building just in front of the City Hall is Statler City. It used to be a very fashionable hotel chain back in 1907 (along with subsidiaries in Cleveland, Detroit, St. Louis, NYC, Washington DC, etc.). Now it's being restaurated and serves as an exquisite event hall for weddings and business meetings. Niagara Square. Opposite Buffalo City Hall. Statler City. Former Statler Hotel. Robert H. Jackson United States Courthouse to the left. Buffalo City Hall. McKinley Monument in the front defining the city center. Buffalo overview. The beautiful view from the observation deck of Buffalo City Hall. Free admission. We continue along Court St. past the NFTA Metro Rail tracks and reach Lafayette Square. The monument "Soldiers and Sailors" is dedicated to all the military men and women who died fighting for the American freedom. A block away is Hotel Lafayette: a historic hotel built in 1902, modernized a few times and still functioning! Lafayette Square. Hotel Lafayette to the right. The Buffalo Niagara Visitor Center moved and is just at the corner of Washington St. and Clinton St. The friendly staff will provide you with information about Buffalo and useful tips. Have a look! Buffalo has lots of buses connecting most parts of the city and its suburbs (Williamsville, Seneca, Amherst, etc.) and only one metro line that's pretty straight forward (literally) and goes from Erie Canal Harbor Station to the University Station (South University Campus). The ride within stations above the ground are free (status 2014), for the underground stations the standard NFTA fees apply: One metro or bus ride is $2, A day pass (unlimited metro and bus rides within Buffalo and till Niagara Falls, NY) is $5. That's a good deal. Cards can be purchased from bus drivers or at the metro station machines. Buffalo was one of the first towns to be electrified via hydro-power from nearby Niagara Falls. The Electric Tower was a de facto monument for that achievement. Today the building consists of offices. You are standing in front of the very few theatres that have been operating for so long as such! The Arts Center offers performances of famous Brodway musicals like "Phantom Of The Opera", "Annie", "Les Miserables" or "Matilda". The St. Michael's Roman Catholic Church is just opposite Shea's a block away. The post office is next to the church. Shea's Performing Arts Center. Front entrance. The building doesn't look big but it actually is. Allentown. Virginia St. at Delaware Ave. In Buffalo, NY you will see many industrial artworks like this one. After a while we come out into the Main St. again, at the corner of North St. Just at the junction you'll spot the Anchor Bar: That's the birthplace of the genuine Buffalo Chicken Wing. Bon Appétit! The genuine Buffalo Chicken Wing (or just Buffalo Wing) was created by Teressa Bellissimo and her husband Frank around 1970. There are different stories how the Bellissimo family came up with that speciality but one of them states that Teressa needed to find some solution after her son came home late and brought some of his friends. Being a good housewife Teressa tossed some chicken wings into cayenne hot sauce and voilà. After exiting the Anchor Bar head to the north along Main St. (which is extremely long by the way). To the left is Holy Trinity Lutheran Church with some beautiful interior followed by the Our Lady of Lourdes Church and Catholic School to the right. At the next crossroad we turn west into Summer St. and then south into Delaware Ave. The Westminster Presbyterian Church in Buffalo is famous for its diverse church activities among others: arts, music & concerts, family picnics and also gay bingo. We're re-entering the historic district of Elmwood Village and Allentown. Feel free to explore this awesome and quiet neighborhood (Elmwood Ave at Allen St.) on your own. Continuing down to Delaware Ave we pass by the Trinity Episcopal Church. The different parts of the church were constructed at different times: The main building in 1886, the Chapel in 1869, the parish house in 1905. Buffalo, NY. Trinity Episcopal Church. Our half-day walk has come to an end! In case you are very tired don't hesitate to return to downtown Buffalo by bus or by metro. The metro rail is free above ground (status: 2014). I hope you enjoyed the first half of the first day in Buffalo, NY! Next to Part 2: Buffalo(ve), NY. Niagara Falls & Canada.